Pink roses carry the charm and sweetness of a new love and friendship. 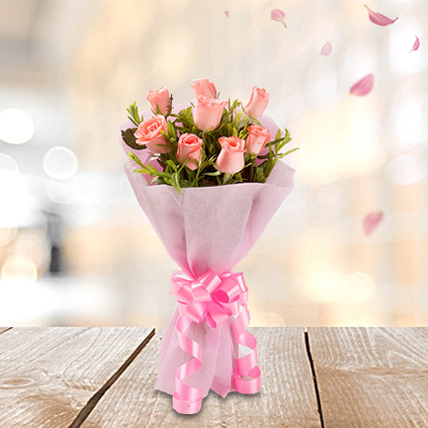 In order to let someone greet in your life or to re-estabish your relation with an old buddy, get this endearing bouquet of 8 pink roses with pink paper packing and matching ribbon bow. All good. It would have been awesome if flower arrangement would have been exactly same as per picture. Overall good experience. Thanks for Flowerscakesonline. I had order this Pink Flowers Bunch to gift my wife. And she loves it. Thanks. Flowers was not fresh and not delivered on time. disappoint with flowerscakesonline. My first experience was not good.